As you may know, Mushroom and I became Parragon Book Buddies earlier this year, after meeting with the lovely people from Parragon Books at BritMums Live in June. Since we became buddies, we’ve been lucky enough to receive a book every month to review and share here. 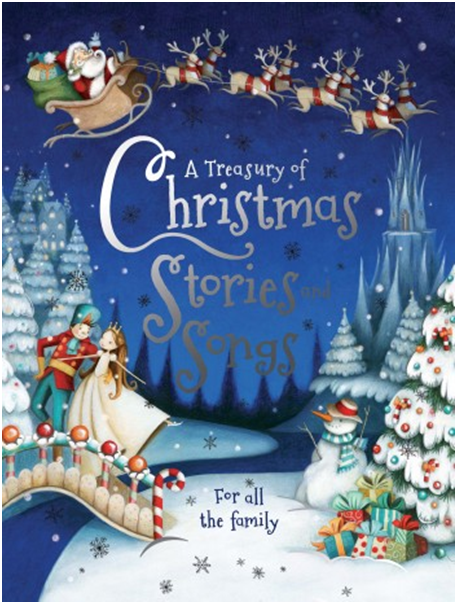 A brand new collection, published just this year, it contains six classic Christmas stories and poems from the Nativity story to the Nutcracker. At the moment, we often spend post bathtime singing (often shortened versions of, I must add!) the Christmas songs he has now learned and I have been rediscovering old favourites like the Night before Christmas and enjoying new stories (to me) like the beautiful Letter to Santa. The first time I read this one Mushroom fell asleep quickly but I continued to read it! 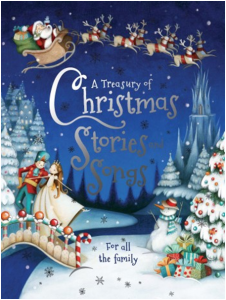 We’ve really enjoyed reading this beautiful Christmas gift (six stories in one and 12 songs!) and no doubt will continue to dip into it well beyond the season. Even if it ends up gathering dust on the bookshelf once the Christmas tree comes down and the new book novelty wears off, I will definitely be getting it out again next Christmas. It’s almost Christmas! For us, it’s a time of rest and reconnection with family and friends so I’ll be taking a couple of weeks offline (although may still pop up on twitter!). 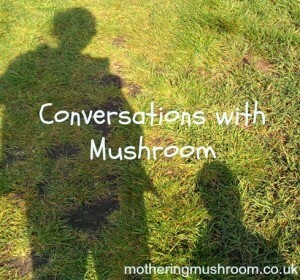 Whatever the season means to you, Mushroom and I hope you’re surrounded by those you love. * In Mothering Mushroom tradition, we’ve made you a seasonal card (it’s a bit more personal than previous years – hope you like it!). *We know the festive season isn’t easy for everyone, so if this is a tough time of year, we’re sending an extra large dose of love to you. Even if you feel alone, you’re not. You can even drop us an email – know that it will be read and responded to within a few days max. So, in my last post I suggested that we might head back to the Olympic Park to (finally) go up the Orbit to see Santa this year… and we did! 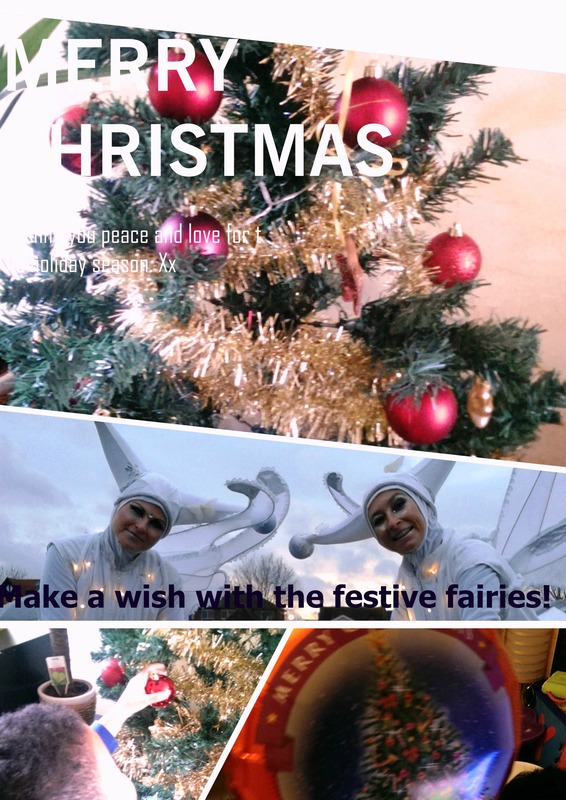 Here’s a photo diary of our day… Starting with the promised orbital baubles! After lunch, we went for a walk where we met some very interesting characters from Fairytales after Dark (unfortunately we left it too late to get tickets for this)! 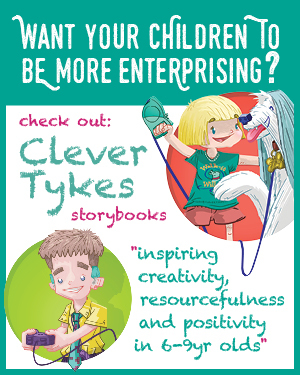 There were giant birds, arctic explorers, trolls, a camel-riding monkey and a moving piano! After the travelling mini show, we headed across the bridge to the soundtrack of a stunnning gospel choir, where there was a craft activity as part of The Floating Cinema. Mushroom made a boat, which he said was his favourite activity of the whole day! Finally, after a quick go on the trampolines in the mini fairground, Mushroom and I headed home via La Petite Robe Rose where we warmed up with some chocolat chaud before heading home. If you want to find out more about the activities at the Park throughout the year, head over to the website. 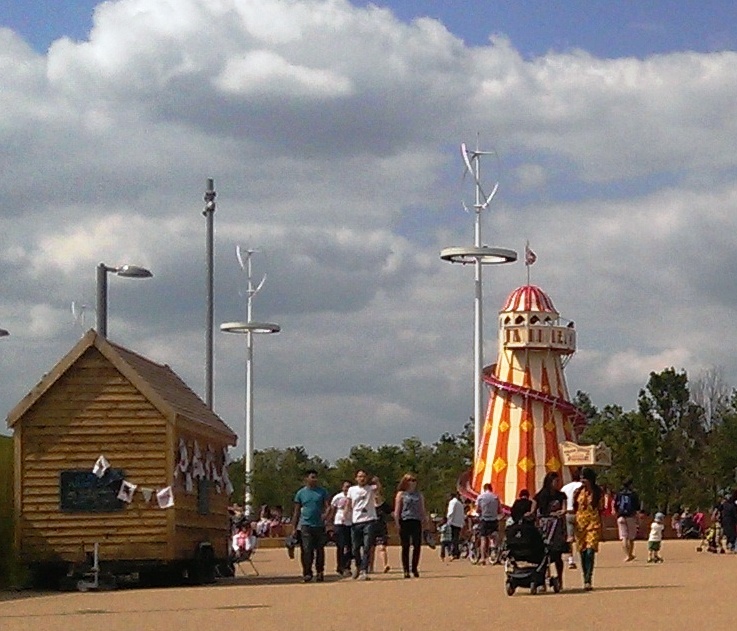 Or if twitter’s your thing, the twitter handle is @noordinarypark – and it certainly isn’t! Disclosure: We are not in any way affiliated with the Olympic Park (we will let you know if this changes!) but just love it (if you hadn’t guessed). We paid for the visit to the Orbit and all the other activities mentioned were free. I was saying recently to a local friend how lucky we are to live within spitting (well, almost) distance of the Queen Elizabeth Olympic Park in Stratford. The first time I visited the stadium was back in 2012 when Mr B and I managed to get tickets to watch the Paralympics (we watched Dave Weir win a gold medal!). Once the park was open to the public in April, it took me a while before I visited with Mushroom. The first time we visited was in the summer, when we made the most of the fountains – definitely Mushroom’s favourite part of the park (and he’s not the only one – you can hear the screams well before you see the water if you go on a hot day!). And we don’t let the cold weather keep us away! We recently went on a boat trip around the park in the pouring rain – Mushroom and his friend were fascinated by the sound of the rain drumming on the roof of the boat and excited by fact that the water level was so high we thought we might not make it under all the lower bridges (we did)! And now that Mushroom has his weekly swimming lessons in the Aquatic Centre, we often make use of the sandpit afterwards before heading home for lunch. Like I said, we really are very lucky. 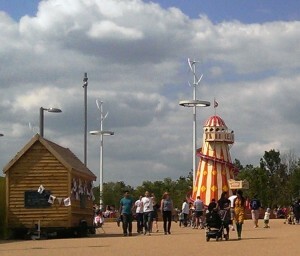 If you’re ever in Stratford, the park really is a must-visit. There is so much to do and see – and I haven’t even mentioned the helter-skelter or the Orbit, which is next on our list. 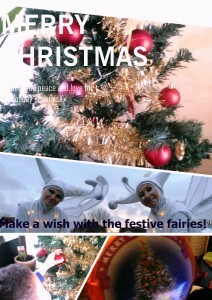 Maybe we’ll make our visit to Father Christmas there this year…! 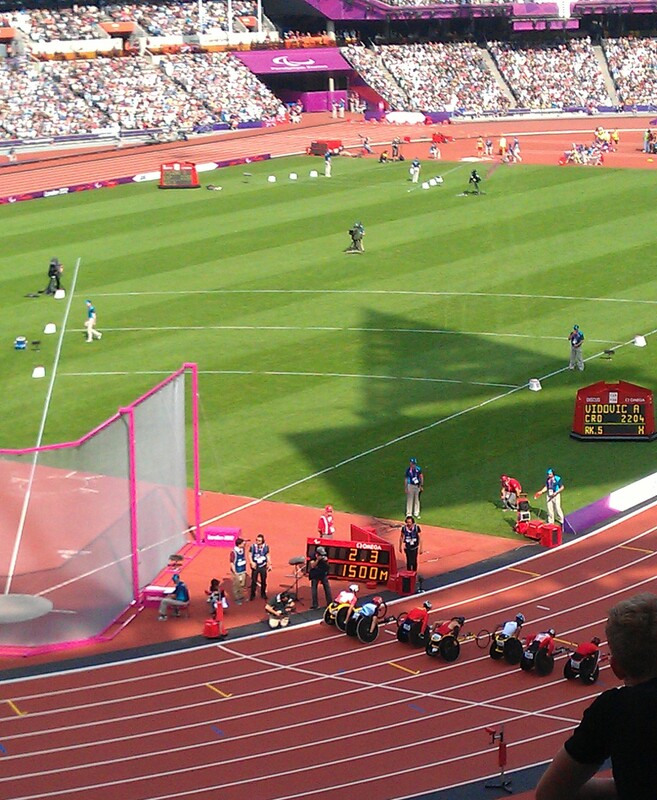 Disclosure: We are not in any way affiliated with the Olympic Park (we will let you know if this changes!) but just love it (if you hadn’t guessed). All the outdoor activity is free to use. 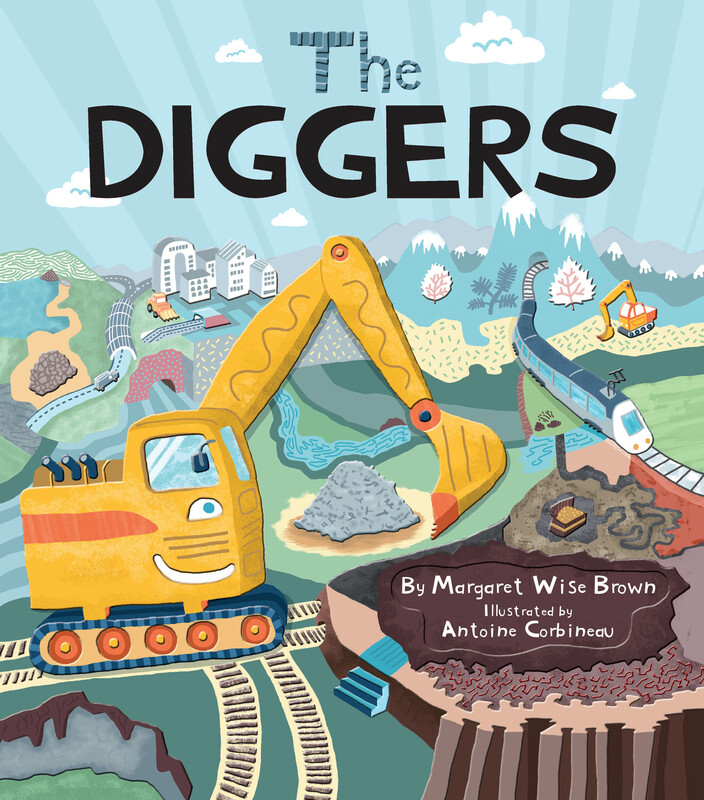 Last month’s Book Buddies book from the lovely people at Parragon Books was from author Margaret Wise Brown, who many of you may recognise as the creator of the wonderful bedtime story Goodnight Moon . 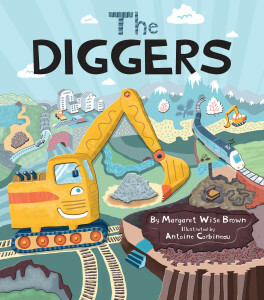 Margaret’s words are brought to life by French illustrator Antoine Corbineau, whose vibrant illustrations show the various textures and colours revealed by the energetic diggers as they deeper and deeper into the earth. 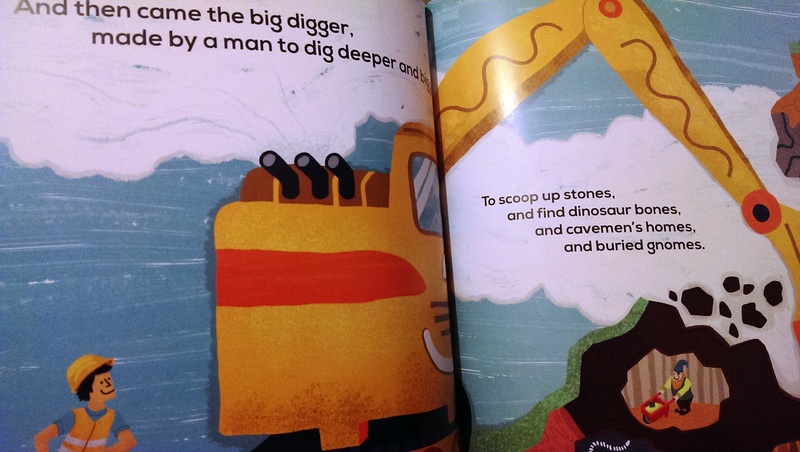 Mushroom, though, despite being very excited when the book arrived and he realised it was all about diggers, was less interested in the words as this one was all about the illustrations for him. At one point he even shushed me and took the book from me to stop me from reading it! 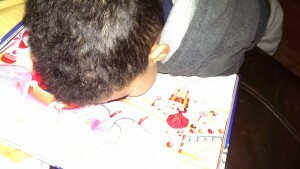 However, I have since seen him pick it up to look at himself even though he tends to turn it down when we read together. Perhaps there is just too much going on for him with this one to cope with the pictures and the words at once but that’s ok, sometimes it’s nice just to look at the pictures… and there is plenty to see.